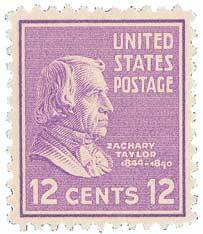 U.S. #817 – Taylor “Prexie” stamp. 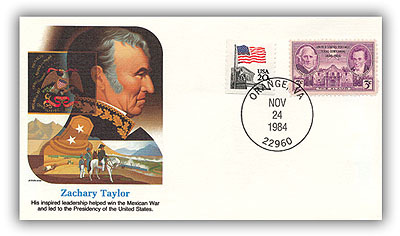 In 1808, Taylor enlisted in the Army, starting 40 years of service to his country. He was an excellent soldier, and was promoted quickly and consistently. He served in the War of 1812, in the defense of Fort Harrison; in the Black Hawk War, receiving the surrender of Chief Black Hawk in 1832; and in the Seminole War in Florida in 1837. 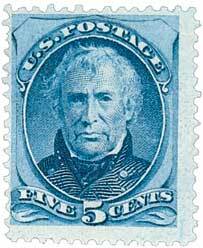 However, it was his victories in the Mexican-American War that made him a national hero. Taylor never lost a battle, earning him the nickname “Old Rough and Ready” from his troops. 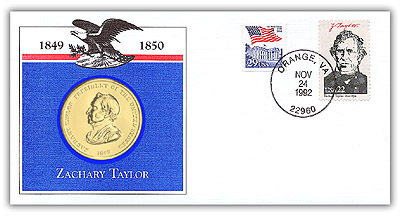 U.S. #2217c features two cancels – one on the stamps first day of issue, and one on Taylor’s birthday. Although Taylor never held an elected office, or even voted in a national election, the Whig Party nominated him for President in 1848 based on his Mexican-American War popularity. He never committed to a political platform, but instead insisted on being an independent. Taylor won by 36 electoral votes. This Presidential election was the first to be held at the same time in every state. Item #20023 – Commemorative cover cancelled on Taylor’s birthday. As President, Taylor lacked experience, so he relied upon the advice of others. However, a man of strong conscience, he could not be convinced to do anything he opposed. During his administration, efforts were taken to build a canal across Nicaragua – a forerunner of the Panama Canal. Britain also showed interest in building such a canal. Eventually the two countries signed the Clayton-Bulwer Treaty, in which both sides agreed to share the expense of the canal. In turn, the canal itself would remain neutral territory, belonging to neither nation. Item #97720 – Commemorative medal cover cancelled on Taylor’s birthday. Issues over slavery laws complicated admission of lands acquired from Mexico into the Union. Taylor attempted to make California and New Mexico states before such controversy could erupt, but was unsuccessful. Southerners threatened to secede from the Union, and Northerners threatened to hold the Union together by force. In fact, Taylor promised that if the South seceded, he would “command the army in person and hang any man taken in treason.” The outbreak of the Civil War was avoided for eleven years by the Compromise of 1850, which was signed shortly after Taylor’s death. 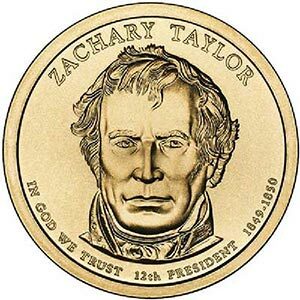 Item #CNPRES12D – The 2009 Taylor Presidential Dollar. On July 4, 1850, President Taylor was present at the laying of the cornerstone for the Washington Monument. For several hours, the 65 year-old President stood in the sweltering summer heat. After he returned to the White House, Taylor suffered from heat stroke. 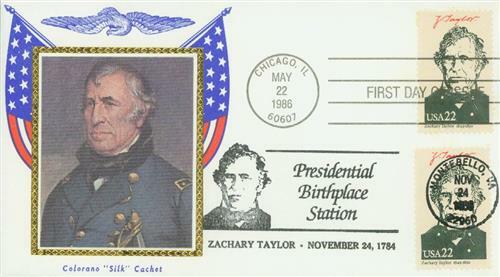 Five days later, on July 9, 1850, President Zachary Taylor died. He had been President for just 16 months. Taylor was succeeded by his Vice President, Millard Fillmore. In 1991, a team of medical experts examined Taylor’s remains to determine if his death had been caused by poisoning. The panel concluded that Taylor’s death was due to natural causes. This entry was posted in November 2015, This Day in History. Bookmark the permalink. 6 Responses to "This Day in History… November 24, 1784"
Mystic is doing a great job putting together this very informative series, ” This Day in History”. Keep up the good work! I really enjoy reading the articles and forward them to my grandson. Your American Heirloom Hinge-less Album is great and I enjoy having it as part of my collection. I WISH THAT “A DAY IN HISTORY WAS AVAILABLE WHEN I HAD TO TAKE HISTORY EXAMS IN SCHOOL!! Thanks for this information about President Taylor. It is always a pleasure to read each segment of TDIH and I look forward to receiving it each day in my email inbox. Great work, Mystic. Ver interesting summary of old Zach. I read that his victories in the Mexican War were rather lucky, but then the book I read could have been written by one of his many detractors. Thanks!